Pathfinder Battles: Heroes & Monsters kicks off with a gout of acid and a hideous draconic scream, for the Huge Black Dragon has taken wing! Based on the Pathfinder Roleplaying Game Beginner Box cover by fan-favorite artist Wayne Reynolds, this giant prepainted plastic miniature is sure to strike terror in the hearts of players every time it hits the game table! 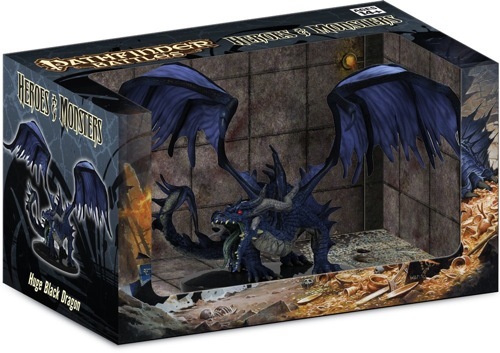 The crown jewel of the Heroes & Monsters set, the Huge Black Dragon stands over 4½" tall! Produced in extremely limited quantities as a case incentive for Heroes & Monsters miniatures, the Huge Black Dragon won't be available for long! The black dragon is too small for a Huge miniature. The miniature itself is not bad and is better than most of the miniatures in the Heroes & Monsters set. For their first set, Paizo and WizKids did an okay job but they still had a ways to go. This dragon is completely outshined by more recent dragon miniatures produced. Gorgeous Black Dragon Brings Your Scenario to Roaring Life! This huge-sized black dragon miniature should be one of the crown jewels of your gaming collection. It recreates the steely writing power of the black dragon on the classic cover to Paizo's Beginner Box for your gaming table. Beautifully sculpted and painted, this miniature should find a home on your tabletop for years to come. I recently purchased this beauty after the case requirement was removed. And man, is it pretty! The detail on this beauty is worth the price alone. It's well-posed, well detailed (green tongue!) and sturdy. I compared the size to the Elder White and Elder Green from the DDM series. It's much smaller in size than the White, but only slightly smaller than the green. All in all, it's perfectly sized for a huge dragon and everything about it screams majesty. I would definitely love to see Paizo and WizKids produce a line of huge Paizo dragons and sell them separately from the Pathfinder Battles line; I would definitely like to see their takes on the iconic chromatic dragons. Five out of five stars! I've seen this sold for $30-45 elsewhere. At $20 it's an excellent value and an excellent addition to my collection of dragons. Think this is a PERFECT Black Dragon of (Huge) size. Without a doubt, this miniature is the "crown jewel" of the Pathfinder Battles: Heroes and Monsters set. I see that some folks think it's a tad "small" to be consider Huge ... and respectfully I disagree ... It's waaay bigger than a "large" dragon on a huge base. It is nearly equal of the huge green that WotC's line produced a few years ago. I for one cannot wait to see more draconic goodness (badness) in the miniatures line. I have to echo what others have said about this dragon. It is gorgeous, and probably the best mini of this set. However, as has been pointed out, it looks to be on the smaller side for a 'Huge' dragon when compared with those from the D&D miniatures sets. It looks more like a Large dragon on a Huge base. Still, a lovely addition to the first set of Pathfinder Battles, and a benchmark which I hope future sets can match or surpass. Note: You must purchase one Pathfinder Battles: Heroes & Monsters Case for each Pathfinder Battles: Heroes & Monsters Black Dragon Booster you wish to purchase. That note should be in bright red. Does it give some kind of notice if you try to order just the black dragon? There is a bright red notice in your sidecart when you click the purchase button. Just to double check since I changed my preorder of a case to a subscription and now can't preorder the black dragon. I am guaranteed to get a black dragon when my subscription case ships as long as I included the premium option as part of the subscription, right? My page shows the booster in my sidecart. I was under the impression that this miniature was given as a bonus for pre-ordering a case. Instead, pre-ordering a case allows one to purchase this? Do I have this right? It won't influence my pre-order either way - I'm still going to get a case. I just want to know if this is correct. Yes, this is correct. You don't receive the black dragon for free if you buy a case. It's just an option for you to purchase if you preorder a case. Alrighty then. Thanks muchly for the prompt reply. To be clear, if you are not using the subscription, and just preordering a case normally from Paizo, I believe you need to preorder the case and also choose the Black Dragon Booster (at the top of this thread). Although I'm pretty sure if you just choose the Black Dragon Booster, it will also force you to purchase a case. But I haven't tried it myself, so I can't say for sure. Is this product available to people who would like to order a case through local retail stores? That's 100% up to the retail store in question. They will have the ability to order the dragon as part of the order but they get to decide what happens to it. So 41/2" tall is that a huge? I'm wondering what the base size is? Press release said it's a 3" base, which means Huge. Yes, the black dragon is Huge. Technically, its name is "Huge Black Dragon." Is there a chance the dragon will be available sometime in the future without having a buy a whole case? I really want one, but I really cant afford to drop that kind of money on miniatures. There is a chance, but we won't know until sometime next year if there are any left to sell individually. Basically, no guarantees. Looks like a nice sculpt. To bad it costs a car payment to get one. No thanks. This is the kind of thing that makes me wonder if I want to continue to support Paizo. Status of my subscriptions being reconsidered. This is a licensed product put out by wizkids.... not Paizo. Besides, I'm sure you will be able to get it for under $70 in the secondary market. The only way anyone can get it first hand is from preordering a case, that includes paizo. Honestly don't care who forces the artificial rarity. Boils down to this. You put a product on your site I want but won't sell it to me unless I buy $275 in stuff I don't want, expect me to reassess giving you my future business. To bad it costs a car payment to get one. I don't think if it as artificially scarce. I think of it as an incentive and reward for people who can and do commit to a bulk order. That bulk order helps ensure the product-line's survival. Just because you want the reward and can't or won't afford to support the product-line doesn't make Paizo evil. What do you think about event-participation exclusives? A shirt, pin, module, mug, pen, mini, mousepad or other doo-dad which can only be purchased by people to attend something like Paizocon. Evil? To me, it doesn't matter that I want the doo-dad. I didn't attend (ie. support) the event, so I don't get to buy the thingie. This isn't about rarity. This product doesn't exist so it can be sold at a high price. It exists as a reward to people who have made a bulk purchase. Don't look at it that Paizo is doing to to spite you... they're doing it to reward me. If anything, be mad at me for having the coin to drop on a bulk purchase. Never said EVIL. Just Disappointed. I thought might be cool to give this mini to a friend who plays pathfinder and collects dragon statues. But I can't. Just saying don't put it on the site as an item only to add the disclaimer saying "oh by the way, you need to buy an entire case of another item to be able to order this." I get "exclusivity" but this is just poorly presented. If you have to buy something else to get it why is this on the main product page for the Battles line as a separate item. And the scarcity is completely artificial, I assume on the part of WizKids. I refuse to believe that there is a sudden special black dragon plastic shortage. These types of products are based on the model of make the stuff people really want hard to get unless they buy the cheaper to make stuff they don't want. This is why I won't buy random packs of any product. I would pay a premium of this item if it were offered stand alone but if you don't want to sell it to me you lose that business and some respect as well. Sorry for me it is a matter of principal. and 2)it has a different code for them to order from the distributor, so they HAVE to put it separately so that it gets ordered correctly. Like any local games store that plans on selling singles. I know mine ordered 2 cases w/ dragons with the plans of selling them seprately at the price ebay stabalized at. I mean, the ToH complete is rare, because the investment involved left little room for over ordering. Ptolus as one book is out of print, but the only thing stopping more from being made is cost vs. profit. The Huge black is the same way. It is possible* that in future sets you'll have another huge black dragon, but for people who want it a) now and b) to not sort for it, the cost vs. reward analysis has to be taken into consideration. To use another recent product, I didn't have the money (or interest) to buy the VtM 20th. I was considering the PDF when Drive Thru was kind enough to put on the page they were releasing a PoD bundle. Now that I see they've revived the WoD, the cost vs. reward analysis of buying more WoD products has changed for me, making VtM 20, WtA 20 etc more tempting. The black dragon is priced at a certain point. That you don't want to meet that point means either a) you wait to see if the secondary market will meet your CvB expectations or b) you do without. It's a black dragon after all, not food, water, or shelter. I am well aware I can live without this mini. I was pointing out that in my opinion you shouldn't put an item up for sale when you won't sell it without bundling it with another, vastly more expensive item. And I am willing to meet the price point advertised except they won't sell this item at that price. Don't mark something at $14.99 if you have to get something for $274.99 to qualify to buy it. Bad Practice and I expect better from Paizo. You and me both. I remember when a friend came to me and said "Look at this new card game, it's really fun." And proceeded to show me his Beta deck with his Black Lotus and Timewalk. Innocent at the time. What do I do, I shrug it off. "Oh, looks alright." Didn't give it a second thought and didn't play for quite a few years. Don't know how many times I've wished I listened to my friend at the time. If I knew then what I do now, would have gone out and bought Beta booster boxes by the case. Ah well. You and me both. I remember when a friend came to me and said "Look at this new card game, it's really fun." And proceeded to show me his Beta deck with his Black Lotus and Timestop. Innocent at the time. What do I do, I shrug it off. "Oh, looks alright." Didn't give it a second thought and didn't play for quite a few years. My partner Donna had an Alpha set before I knew her. Her and her husband were really big in Magic before he got sick. Funny story. the last Origins we went to, I couldn't get the Donna to stand beside the Pikachu for a picture (Donna was about 5' nothing) When one of the Pokemon demo people came up offering to teach us, I told her, "Back! I just got her cured from a 10 year Magic addicition! I don't need a card relapse!" They will sell it individually (at $15, presumably) if they don't receive enough subscription orders to exhaust their stock prior to the first set being shipped. What do you think about event-participation exclusives? A shirt, pin, module, mug, pen, mini, mousepad or other doo-dad which can only be purchased by people to attend something like Paizocon. I once wanted that cute mug from some company. They "gave it away". By "give away" I mean "Force you to travel many hundreds of kilometres at a very specific date and visit this shindig they were having, AND paying for admission." Just to get the mug. Needless to say I never bought anything from those bastards. I'm entitled to get anything I want! I just got my store account credit and was trying to get the black dragon with my subscription, but it shows at around 68$, including the 75% discount!! Is this a store problem or is it really the new price? This is a bug we hope to have fixed soon. Does that means that I'll be able to get a black dragon with my order at the same price it was before October 1st? We've fixed the bug and I've poked your shopping cart. The black dragon is displaying the correct price now ($3.75). Just saw that, thanks! trying to finalized my order, but i can't apply my store credit correctly... any idea? It will only let me use part of my credit. just enough in fact to pay for handling and shipping. but i can't use it to pay for the actual items. Touche. Though there are some interesting articles about synthetic diamonds. Store credit gets used on subscriptions in a slightly different manner than regular orders. For using store credit on a subscription like this, check out like normal and then visit your My Subscription page and make sure the little box for "use store credit on subscriptions" is checked. Checking that box will apply any available store credit to your subscription shipments. Now, the tricky part is if you have other Paizo subscriptions which the store credit might be used on before the minis might ship (since the minis are much further spread out over time than other subs). But that's a whole other kettle of fish. I try that (checking the box) but it still doesn't show. However, i have not completed my order. I just went a bit ahead to see if it would apply but it didn't. I'm gonna try to go ahead and see. It's not going to show on the subscription until we are processing it for shipping. This is because you might choose to use the store credit for something else between now and when the subscription ships. Sorry for any confusion. Ok, thanks for clarifying. I was mostly confuse by the fact that i could use only a part of it. So, if a web site that carries literally thousands of items carries one that you don't like, you're going to pick up your dice and go home? You, sir, are aptly named.